The Professional Regulation Commission (PRC) released the updated list of Continuing Professional Development (CPD) Programs for Nutrition Dietetics, one of its regulated programs. CPD Program refers to a set of learning activities accredited by the CPD Council such as seminars, workshops, technical lectures or subject matter meetings, non-degree training lectures and scientific meetings, modules, tours and visits which equip the professionals with advanced knowledge, skills and values in specialized or in an inter- or multidisciplinary field of study, self-directed research and/ or lifelong learning. Corresponding CPD unit requirements for the renewal of PRC ID will be mandatory starting July 1, 2017. For Nutritionists Dietitians, a total of 45 units are required to be complied every three (3) years. Below is the updated list of CPD Accredited Programs for Nutritionists Dietitians, courtesy of the PRC Council. 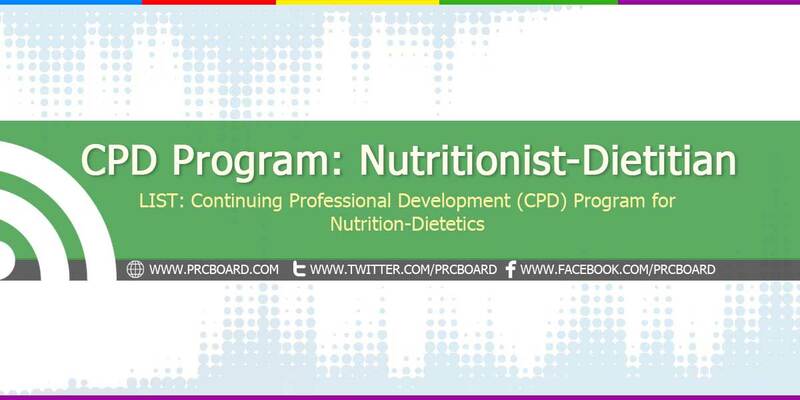 To receive updates on any announcements about CPD Program for Nutritionists Dietitians, we advise our readers to bookmark this article, visit PRC official website or follow us at our social media pages via Facebook and Twitter.